Isaak’s cathedral is named after reverend Isaac the Dalmatian, a Byzantium monk that lived in the 4th century. This Saint is not really widely known in Russia. It was dedicated to Isaac because on May 30th (by the 12-day slower Julian calendar) the remembrance day of this hieromonk, who propagated Christianity despite persecution, used to be celebrated. Peter the Great, the founder of Saints Petersburg and the first Russian emperor, was born exactly on that day in 1672. That is why several years after the appearance of the city; the first built church was dedicated to Isaac, the Tsar’s protector. It was situated approximately in the same place that the Admiralty building occupies nowadays. The church was rebuilt and moved 3 times: the second version of it was in the place currently occupied by the Bronze Horseman, and the third exactly where the cathedral is located now. The fourth and the last version of the church is the cathedral itself, recognized as a masterpiece of the 19th century’s architecture, that was built in 1858 by the design proposed by the French architect, August de Montferrand. Its construction took approximately 40 years, and including the interior design cost the treasury around 24 million Rub. Just to compare, the annual budget of the Russian empire in 1842 was 187 million Rub, while the USA purchased Alaska in 1867 for roughly 11 million Rub. 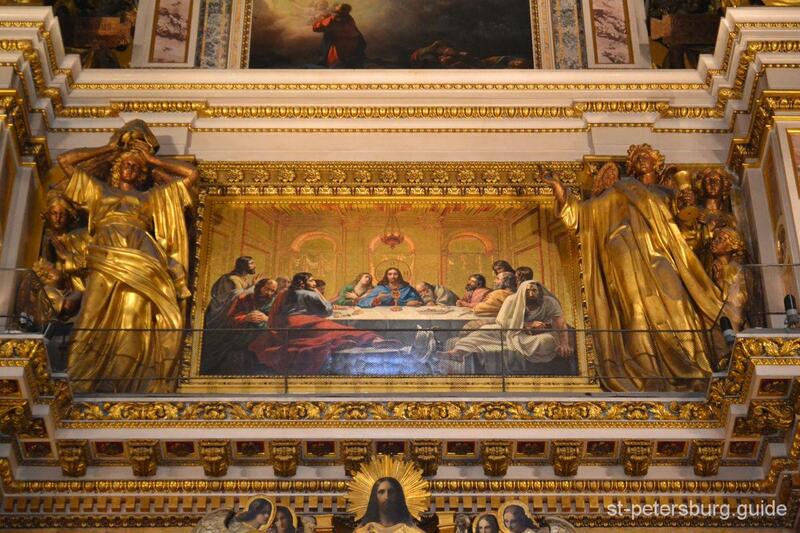 St. Isaak’s Cathedral is the Worldwide known masterpiece of architecture, monumental painting, mosaic and sculpture. From all four sides the facades of the cathedral are decorated by symmetrically placed porticos with 48 monolithic columns that are made from granite and each weighing 114 tons (255, 360 lbs.). In total, there are 112 monolithic columns of varying sizes in the cathedral and over 350 sculptures. The figures of the apostles quietly rest on the gables, while the angels, each holding a lamp have occupied the corners of the building. The dome’s gilding required around 150 kilograms (331 lbs.) of gold leaves and it has not been gilded again since the construction of the cathedral was completed. The building’s facades were faced with the Ruskeala marble. The interior design of the cathedral can astonish with the perfection of shapes’ execution, at the same time, the numerous pieces of art, the combination of colourful gems and gilding – all create a rich spectrum of colours. The walls, the floors, and the pylons were finished with white, yellow, green, red and grey marble, while semi-precious stones – malachite and lapis lazuli – were used for the lining of the chancel part of the cathedral. Magnificent mosaic icons, executed in the Romanesque style, sculpture, monumental pictorial canvas and frescos constitute the layout and graphic presentation of the cathedral. The top painters and sculptors of that period, among them Fyodor Bruni, Karl Bryullov, Pyotr Basin, Ivan Vitali, Stepan Pimenov, worked hard on the creation of these masterpieces. For instance, the area of the ceiling of the main dome is 800 square meters (8,611 square feet), and the total area of mosaics is 530 square meters (5,705 square feet). Just imagine how much work and patience it took to complete them. No matter how much one tries to convey or describe the entire beauty or the magnificence of the cathedral by the means of dry numbers, or even by eloquently used epithets, it is an absolutely impossible task. That is why I strongly recommend that you go and see this masterpiece with your own eyes. When standing in the centre of the cathedral, right under the dome and if you look upward into space, an incredible sense of inspiration will fill your body and you will realize the limitlessness of the human capabilities, and the immensity of imagination and fantasies. Currently, the cathedral is a unified museum of Russian iconic architecture and visual arts. One of its parts still functions as a church and a place of worship, however, this does not impact the dress code because it is located in the farthest small part of the cathedral. There are also no restrictions on the amount of time that you could spend inside. While wandering around the spacious cathedral and marvelling all of its beauties, you most likely will come with some questions, such as: “How was it built?”, “What are the sculptures made out of?”, “What is under the dome?”, “How were the mosaics assembled?”, “What is the capacity of the cathedral?”, etc. Do not be humble and ask your tour guide for the answers, however, most likely you will learn all about it during the tour. It is also possible to get all the way up to the cathedral colonnade and admire the panoramas of Saints Petersburg from the bird’s-eye view. The picture that you see from up there is indeed remarkable and even slightly mysterious. You can make a full circle and that will enable you to see the city from all possible angles and cardinal directions that are indicated by white paint on the floor, for your convenience. Make sure that you take into account the fact there is no elevator that could take you up there and will have to mount 262 steps of the spiral staircase by foot. It would not hurt to wear comfortable shoes and there is no need to be scared of heights, as everything is really safe. You will be 43 meters (141 feet) above the ground and it could get windy at such an elevation, so make sure to bring a warm coat or a pullover along.